The hardness of spring steel makes it possible to be wound only in the cold state in smaller wires (typically up to .5 inches or so.) If a larger wire is attempted to be formed into a spring it frequently cracks and renders the spring useless. It is therefore necessary to heat the wire up to a red-hot condition. When it is red-hot it is very soft and malleable. The molten wire can then be wound into a spring and then dropped in oil to quench the steel. Sometimes a subsequent heat-treat in an oven or furnace is also performed to finalize the spring production. 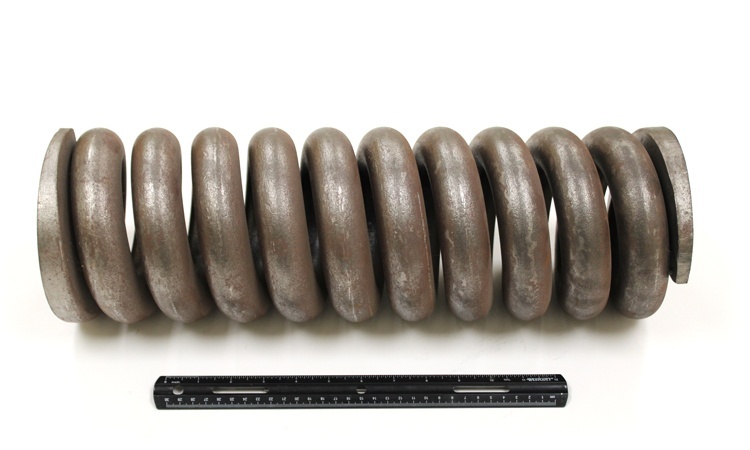 When hot winding a spring, the developed length of the wire is calculated prior to production. The ends of the wire are frequently flattened so once the spring is formed it will already have close ends and no grinding function will be necessary. Grinding of such a large wire would be time consuming and expensive thus flattening of the ends before production is both economical and time saving. Hot winding springs can be a dangerous process, and because the technology is different than that of cold wound springs, hot wound springs are frequently manufactured only by spring houses that specialize in hot winding. Because the bar is heated to a red-hot condition, the hot wound spring is typically performed on a lathe instead of a spring winder. One hot wound house that I visited actually had the lathe move as the spring was wound so that the person winding the spring could stand still and focus on the hot wound bar. Replacing your made-to-order hot wound springs with hot wound stock springs can save you both time and money. More often than not, when a hot wound spring is needed urgently, the time becomes far more important than the cost of acquiring that spring. A customized order will take time to get to you, whereas if you order a stock spring, the shipping process can be expedited to meet your deadlines. Even though Hardware Products does not hot wind springs, we do have hot wound springs as a part of our stock spring line. To our knowledge, we are the only spring house in the country that stocks hot wound springs. We have hot wound springs in 0.75-inch wire and 1.0-inch wire. They are available from stock and can be shipped the same day as ordered. If ordered after lunch, they can be shipped the next day. Please check our stock spring catalog for hot wound springs or request a quote if you know what you want!